Welcome to the SUO Blog Hop! 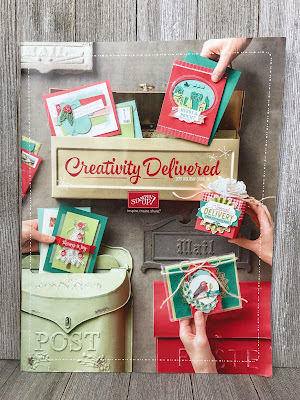 Today we are featuring all our fave designs from the new Holiday Catalog! I am showing you some cards that I made for my recent team meeting using the Merry Little Labels stamp set & coordinating Everyday Labels Punch. The girls had a heap of fun making these cards, too! Isn't this set just the sweetest & it works so well on cards as well as tags! Hooray for getting more bang for your buck! You can get a neat 16 labels from a sheet of A4 cardstock using this new punch. I made two other versions of this card with some simple tweaks to show off the sentiment in different colours. All three versions are on Thick Whisper White card stock bases with the Merry Music Specialty Designer Series Paper (DSP) stamped with the Brushstrokes background stamp in Pool Party. I just love this effect! I have also used Thick Whisper White card stock for all the sentiments, stamped with the Merry Little Labels 'let it snow' sentiment & cut out with the Everyday Label Punch. I have also used the new Leaf Punch for the leaves on all the cards & stuck them to the Label with Dimensionals. This first one I have done in COPPER - drool! All the girls had a good laugh when I pulled out my copper version haha! You know I love my copper! I have Copper Heat Embossed the sentiment& Leaf Punched the leaves in Copper Foil. I have also added a Copper Foil layer underneath & used the Crinkled Ribbon in Night of Navy, Burlap Ribbon & Copper sequins from the Metallic Sequins Assortment. This second little beauty also uses the Crinkle Ribbon in Night of Navy, but tied with a bow at the front, with the sentiment stamped in Night of Navy & some more of the Merry Music DSP in black punched for the leaves. I have added some of the gorgeous new Black Rhinestone Jewels to this one. And lastly, this is the one I got all my team members to make with Pool Party Shimmer Ribbon, Copper Foil leaves, Copper Sequins & Copper Metallic Thread. We also stamped the inside to match in Pool Party. This is another of the sentiments from the Merry Little Labels stamp set. Make sure you hop around the rest of the crew, you don't want to miss anyone's gorgeous projects! !